Do you suppose there was anyone who knew nothing about John Huston and had never seen any of his films until he appeared onscreen in Chinatown? Did they see anything unusual? I doubt it, though it does seem a strange introduction to him as a professional artist. Did they race out of the cinema in search of Treasure of the the Sierra Madre based on his acting? Whenever one director casts another director in a movie, a strange circumspection rises in my mind and I don’t think that I am alone among those who notice such things. If we’re not talking about Clint Eastwood or George Clooney or someone similarly experienced as an actor, then one does wonder why someone more known behind the camera is deemed superior to actors in need of a job. Of course, if you’re making the movie, then you can do what you like. My first exposure to François Truffaut was in Close Encounters of the Third Kind. I think someone, probably my brother, leaned over and whispered, “That’s François Truffaut.” I probably nodded in feigned recognition. As far as I was concerned, he was some dude with a French accent that Stephen Spielberg had located to make his movie feel international. had to pass before I learned about Les Cahiers du Cinema and La Nouvelle Vague and all that flowed from that: the director as author of a film; emphasis on characters over plot; arguing about films way more than people should; etc. Truffaut did in fact act in a number of films before Close Encounters (and before Day for Night). You can decide for yourself how skilled he was, but he definitely looked comfortable in front of the camera. 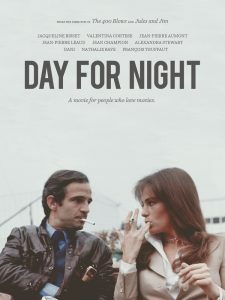 So, I saw Day for Night long after This is Spinal Tap, so there was no possible way that I could take seriously any movie in which the director narrates the action on camera. I started with a smile as soon as Truffaut starts walking across the first setup. Really, I expected him to approach a wall and acknowledge that he could walk no farther. I have also seen countless documentaries about making movies and Truffaut has effectively colored my expectations. I know there is pure silliness going un-captured just behind that door there. Truffaut is always just outside the frame in his movies and I doubt he wanted it any other way. Maybe that’s what seems so strange with other directors who look a little less comfortable. Do you suppose that Huston gave Roman Polanski a lecture or two back in the day? You’ve Got to Check This Out is a blog series about music, words, and all sorts of artistic matters. It started with an explanation. 36 more to go.